We hear that the Czech Philharmonic will announce Semyon Bychkov on Monday to succeed the late Jiri Belohlavek as music director. Bychkov, 64, is an outstanding conductor of immense international experience, and one who has worked fruitfully with the orchestra over the past few years. The Czech Phil has always been at its peak with a Czech in the podium. There was an opportunity for Belohlavek to be followed by one of his proteges – Jakub Hrusa, Tomas Netopil, Tomas Hanus – but the Czechs, not for the first time, have chosen an international brand over local brilliance. Jakub Hrůša is good. But he already has a chief position in Bamberg, which is not very far away from Praha. And I gather his contract obliges him not to accept another post within Europe. A Czech colleague tells me that a post with the Czech Phil means ‘grand old man’ status. You don’t move anywhere from there except to the National Theatre – which doesn’t have the status now it did in Talich’s time. Best check the reasons for the others not being appointed before jumping to conclusions. 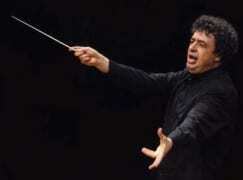 Bychkov is an honourable choice, setting nationalism aside. Hrusa will be with the Czech Phil sooner or later. If the Philharmonia Orchestra have any sense, they will soon secure Hrusa’s services as Principal Conductor by upgrading his current staus with them. He is one of the few younger conductors around who can draw the warm string sound from them for which they were once so famous. So can his co-Principal-Guest fellow Santtu-Matias Rouvali. Brilliant choices both. Much as I deeply admire Salonen generally, and for so many things, his recent Sibelius with the Phil was so cold – neither of these conductors can be accused of that. And they both have the total discipline and technique too. Exciting times already here. The word on Hrusa (as I recall from reading Slipped Disc) is that he’s a little young and inexperienced for the post right now. Bychkov is a fantastic musician and this should be a great partnership (assuming he & the orchestra don’t hate each other). Presumably by the time Bychkov leaves, Hrusa will be deemed ready. Of course if he’s as promising as they say, there’s a risk that he might not be available when the time comes; but they can burn that bridge when they come to it. There is nothing inexperienced about Hrusa even now. He’s all there. But the Czech Phil does have the attitude I’ve already mentioned, that the appointment should be an official Grand Master. It’s a logical choice. From what I can tell of the performances I’ve seen, Bychkov and the orchestra have a great relationship. I totally understand the desire of having the flagship Czech orchestra led by a great Czech conductor, but the orchestra wants to be seen as a major international ensemble, with the attendant tours, recordings, soloists (maybe even new hall?) that entails. Of the three Czechs mentioned, only Hrusa has the kind of international reputation the orchestra would think it merits, and he’s still in “up and comer” mode. Assume Bychkov stays for 5-7 years, continues to burnish the orchestra’s reputation, and at that point Hrusa seems a likely contender; meanwhile he’ll surely continue to work regularly with them. I saw Jakub Hrůša conducting Má vlast at the beginning of this week and I have to say it really was wonderful. I also saw Semyon Bychkov conduct the Resurrection Symphony earlier this year and it was the best Resurrection I’ve ever heard. I would have loved to have seen another Czech at the helm of the Philharmonic, but Bychkov is a great talent and certainly worthy of the role. At 36 Hrůša is already a fantastic conductor; I too hope that he’ll succeed Bychkov as one of the Czech Philharmonic’s truly great directors. Big Name Orchestra needs a Big Name Conductor. Makes perfect sense. What a perverse statement from NL, instead of “shuns rising talent” it would have been more appropriate to state “are very fortunate in obtaining the services of probably the most under rated conductor alive today”………give it a rest Mr Lebrecht. Agreed! On hearing Bychkov guest with both Philadelphia and NY Phil, I’ve been impressed and wondered why he didn’t have a major gig. IMHO, he’s one of the best. The big question is how did they get him? He’s been pursued by orchs. in Europe & internationally to be Music Director ever since he left WDR. I wonder what this orch. offered to convince him to accept the position? Czech Phil is very very lucky indeed. And kudos to their management for snagging such a great talent, who previously seemed no longer interested in the responsibilites of being a music director. Oh, Jan, thank you for sharing that! It’s a brilliant interview which reveals so much about the Maestro and his choice – insights which are gratefully appreciated. Warmest wishes to you! A conductor of depth, vision and integrity. His performances are not to be missed! Bychkov signed the five-year contract today. He will officially assume the position in the next season (i.e., 2018/2019). As of 2018/2019 there will be two principal guest gonductors — Tomáš Netopil and Jakub Hrůša. In the current season (2017/2018) Bychkov will conduct four programs, as well as Hrůša (principal guest conductor already).